With the increased process, practice and technology innovations in the diversity & inclusion (D&I) space of late, organizations are rolling out more-and-more new initiatives every day; and it is exciting – we are finally raising the bar on what for too long had been an under-funded and sometimes overlooked gem in our corporate arsenal. And as exciting as this news is, we are compelled to ask ourselves a fundamental question: are we marketing these new D&I opportunities for success? The answers to that question go far beyond the basic tenets of corporate communications and transparency. We are aiming to light a fire…motivate the workforce…we are looking to create the highest level of visibility and the greatest traction for our expanded diversity and inclusion program. That means we ought to sell it like a shiny red sports car and not a mat-grey utility van. We must look at our visual branding, our program positioning and our communications language as though we were launching the next iteration of the iPhone. We know that we are competing for our colleagues’ attention so we have to cut through the noise if we are going to be effective. So then as a first step towards maximizing our success, let’s begin by examining past initiatives and make the commitment to replicate as few of the prior elements as possible; after all, we are aiming to stand out – and few things achieve this better than noticeable change to the Status Quo. Second, let’s take a page out of consumer marketing books and sell the sizzle rather than the steak. That means showcasing the benefits of participation to the users, so that the “what’s in it for me” factor is right there – front and center. And the pay-back has to be in line with the message, meaning that the opportunities for inclusion, belonging, advancement, rewards and/or career development are explicitly spelled-out – the Quid Pro Quos of engagement have to be communicated visibly and prominently; the give-and-take clearly has to be understood. This doesn’t mean leaving the main course elements of the program by the wayside, it just means we should let our users reach for them on their own only once we have successfully developed their sweet-tooth for the dessert. Third, making the link between participation, corporate results and personal gain integral to the virtual contract insures that there is an equitable awareness of expectations from both management and employees – which in itself is a driver, given that many past cause-and-effect relationships at the enterprise level have been known to be murky and opaque. Last but not least, let’s not be shy about reaching into our organization for some professional help. Ask a couple of the internal marketing folks for some positioning pointers, have a coffee with the guru from corporate communications around messaging or grab lunch with the advertising coordinator to get tips on visibility strategies. Borrow from their toolbox of everyday go-to-market tricks. 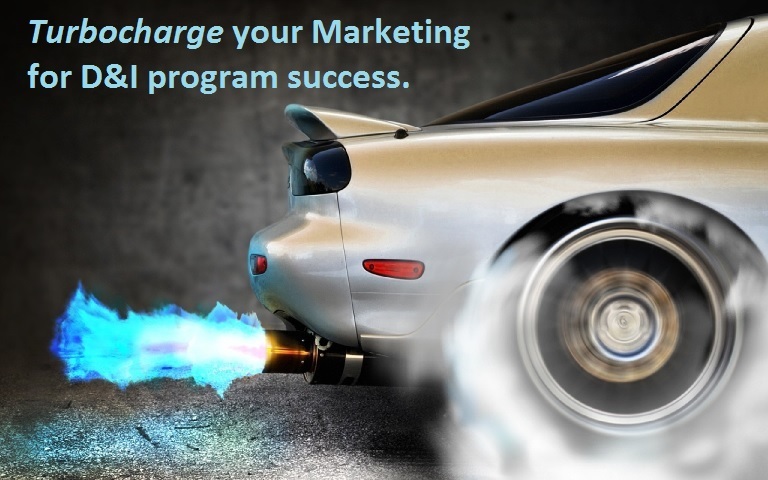 By applying these basic marketing techniques to your program, you are deploying methods that are tried-and-true. They are likely being used on a daily basis by your organization already to captivate and engage your own customers. All we are doing is borrowing from their playbook and turning those marketing assets inward to increase the success of our new diversity and inclusion initiatives.